Business in Motion: Insights from Business Leaders: Do You Have a Black Book? Keep a Mysterious Black Book - And improve your sales effectiveness! Call this a 'throwback' idea or tip but if you're serious about a career in sales and you want to continue to improve your selling skills and abilities (and subsequently) earn more, then keep a black book. A black book is literally a bound book of some sort or another (see some popular choices below) that you use to record virtually anything. It is a single and central repository of everything that is or could be important or significant to you. 1. Black books keep you more organized. Instead of having sheets here and there, notebooks here and there, smart phone notes here and there, your black book is the one place for everything. This means you can find everything you need. Use it for brief client notes, selling tips, ideas on prospecting, brain storming sessions on marketing, to do lists, doodling (yes, doodling), sales meeting notes, quotes (see the list below for more ideas). Everything and anything you might want to refer to or remember. It will save you time, frustration and hassle. 2. Black books keep you focused. You can record important things like your goals and objectives. You can use your book to create a daily "To Do" list. Note your priorities. Your book will keep you on task. 3. Black books keep you motivated. Use your black book to record your 'victories' or to list your dreams. Use them to record your results. Jot down inspirational quotes. Cut out pictures of what you'd like to buy or places you'd like to visit or scenes that inspire you. Tape them inside. Refer to them. Remind yourself of what you've achieved and what still lies ahead. Note your 'losses 'and 'defeats.' Jot down why you might have lost a sale. What did you learn from the experience? Were you prepared enough? Do you need to brush up on a skill? Should you be working on your product knowledge? You'll find it quite rewarding when you take personal responsibility. 6. Black books make you look...well...smart. This may not be a big deal for you but when you go into a meeting with your black book under your arm you immediately set yourself apart from the crowd. Look around. Half the people won't even be equipped with a pen or a pencil. People who count (bosses, executives, owners and the like) take note of someone who comes prepared. It elevates your status. 7. Black books become your sales encyclopedia. When you read or hear a good sales tip, jot it down or cut it out and paste it in your book. If you listen to a speaker and you like what he or she says, put it in the book. When you learn a new technique, grab a pen and write it out. This simple act will help you retain the information better. More importantly, you can go back and review your notes every month and remember those sales tidbits your forgot. 8. Black books make you mysterious. Well...not really... but people will take notice and the WILL ask you about it. Then you can show them how valuable it is. Pass the word. Do a good deed. All that stuff. In any event, it's kind of fun because others get intrigued by it. 9. Black books create a legacy. I have black books dating from the late 1980's. Every now and then I haul out one or two. I see how I have progressed and matured. I sometimes see where I have regressed. Here and there are some really hare-brained ideas. But there are also some interesting insights. In any case, it gives me a sense of personal development and growth. I suspect it will do the same for you. Here is a summary list of things you record in your black book. But don't feel constrained. Use it however you see fit. ... you get the picture, right? First off, black books don't have to be black. Color doesn't matter. It's what's contained inside. Next, go to any bookstore and you'll see ever-growing displays of "Moleskin" books that are leather or cloth bound. More expensive, they tend to have a 'neat' look. People like Ernest Hemingway used them, so you'd be in good company. They come in different sizes and themes. Piccadilly make a less expensive version and it's just as effective. Check them out on line. I have gone to art stores and purchased blank sketch books. These books are sturdy rugged things, and they give you lots of space to write, sketch, and map out your ideas. But you don't have to get fancy. 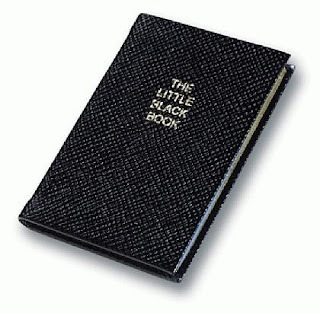 Your black book can be an inexpensive wire bound notebook that you can get almost anywhere for a few bucks. Doesn't matter. Whatever you like; an expression of yourself. Black books or 'journals' are nothing new by any stretch of the imagination. Caesar had one (it was in a scroll format, of course). Napoleon had one too. Most professional golfers keep a version of a black book. Most great figures had a black book of one sort or another. I'll bet a lot of sales gurus have them as well. Can your Smart Phone be a Black Book? No. First off, it lacks the panache. (Look that word up). More importantly, they are not particularly good for extensive notes. Use your phone as a memo pad, not black book. Invest in yourself today and you'll find yourself in good company. Jim Domanski is president of Teleconcepts Consulting and works with companies and individuals who struggle to use the telephone more effectively to market and sell their products and services. Visit his web site at www.telesalesmaster.com or call 613 591 1998.